It’s funny and disturbing how many of my status updates are related to food. =) Here’s a blog post dedicated entirely to food. My apologies in advance to anyone who is on a strict diet! On Saturday, Holly and I made strawberry crepes for breakfast and we got lots of comments from you, requesting the recipe. So, here ya go! If you try them out, we’d love to hear how you like them and how it goes!! In a blender, beat eggs, salt and melted butter. Add water and milk and beat in flour. Mix until well blended (no lumps). Now, they say to refrigerate it at least 2 hours or overnight, but we never think this far ahead so we don’t know how much better it might be if we ever did that step. =) In a heated crepe pan, pour enough batter to just cover the bottom of the pan thinly. Brown slightly on one side, then flip and fry slightly on other side. Cool and stack in layers. Crepes may be made in advance, but must be used at room temperature. Makes about 16 six-inch crepes. I prefer to make about 10 ten-inch crepes since my Mom always used to make them bigger. For filling, we like to use fresh strawberries, cut and sprinkled with a little sugar. Holly also makes the most delicious cream cheese filling that provides a little smoothness and zest. It’s just basically 8oz. cream cheese, 1/4 cup of powdered sugar and a couple of tablespoons of freshly squeezed lemon juice (half a lemon). Beat until smooth and enjoy! We have some leftover strawberries, so I just may have to make another batch this morning. In other food-related news… =) Matthew (from Humble Pie) came over last night and made his latest genius creation: a margherita pizza. No, not like the drink — that’s what I first thought, too. Here’s a picture. 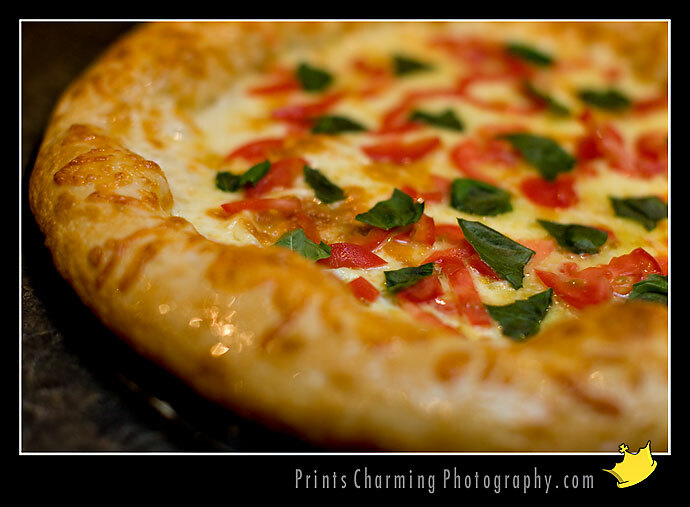 It’s got an olive-oil sauce instead of red sauce, a blend of 5 cheeses, then sprinkled with fresh tomatoes and basil. It sure is a beautiful pie, and it really went down easy. =) The two of us polished most of it off without much trouble and enjoyed every delectable bite! There is a down side to having great cooks in the family, that people probably don’t think of much. It makes it harder to enjoy eating out! Seriously! Holly’s Dad has ruined steak for me. His ribeye and filet are so juicy, tender and flavorful that even Ruth’s Chris Steakhouse was a letdown last time I went there. Now Matthew’s doing that with his pizza and Holly’s done that with her Chicken Piccata, too.